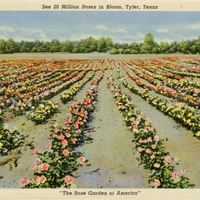 A postcard depicting roses in bloom in Tyler, Texas, which is also known as "The Rose Garden of America." This postcard is part of a collection of postcards kept by Lucile Campbell, a schoolteacher in Sanford, Florida, for 30 years. In 1931, she took advantage of a special rate for teachers and sailed to Europe, where she traveled for several months and is thought to have acquired many of these postcards. During the 1940-1941 school year, Campbell taught at Sanford Grammar School. Before her retirement in 1970, she taught at many other area schools, including the Oviedo School, Westside Grammar School, and Pinecrest Elementary School. Campbell used these postcards as aids in her classrooms to teach advanced subjects, such as Shakespearean drama. The collection, along with her other teaching aids, papers, and photographs, was later found at Sanford Grammar School after it became the University of Central Florida's Public History Center. Campbell's postcard collection and photographs provide insight into the life of a respected Florida educator. Original 3 x 5 inch color postcard: ACC# SM-00-243, file folder 1 (U.S. blanks), box 10A, Lucile (Mary Lucile) Campbell Collection, UCF Public History Center, Sanford, Florida. Digital reproduction of original 3 x 5 inch color postcard. 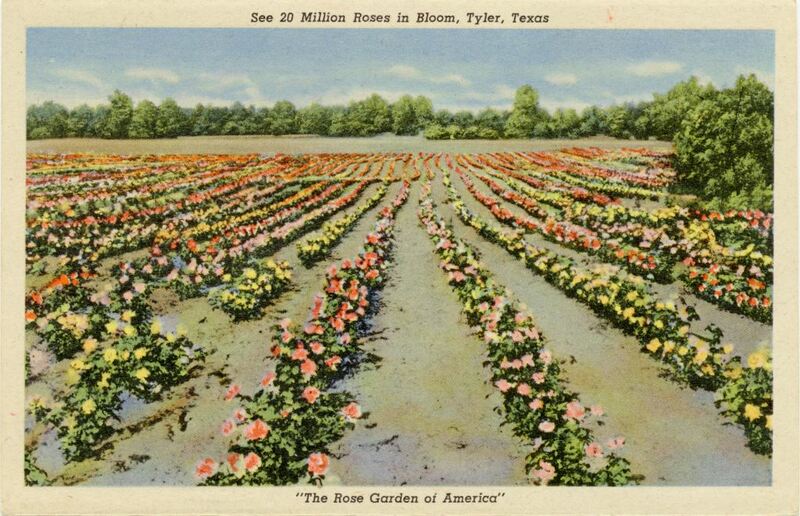 "Tyler Texas Rose Industry." Tyler, Texas. http://www.tylertexasonline.com/tyler-texas-rose-industry.htm. “See 20 Million Roses in Bloom Postcard.” RICHES of Central Florida accessed April 22, 2019, https://richesmi.cah.ucf.edu/omeka/items/show/6680.